Alex Haley’s book Roots: The Saga of an American Family was an immediate bestseller. Haley’s success, however, did not happen overnight. He had worked for many years and made many sacrifices to achieve his dream. In the following autobiographical narrative, Alex Haley shares an incident that marked a choice, a turning point in his life as a writer. He opens the narrative with one of his main points—writing requires sacrifice and dedication. Many people cherish the fond dream of becoming a writer but not many are able to see their dream come true. Alex Haley also wanted to be a writer and he succeeded. It is perhaps human nature to be drawn towards fame and wealth. Yet, as Alex Haley points out through his own experience, in order to become successful, one must learn to struggle in the Shadowland of dreams—a deep forest that can swallow up those who swing and hesitate. Only the determined stand a chance of making it. 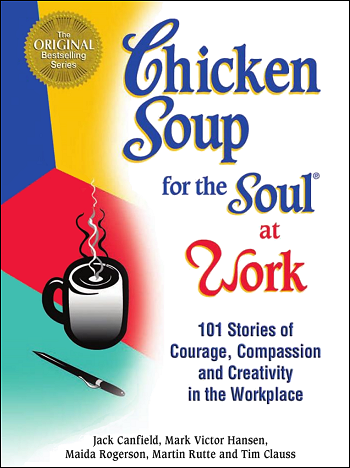 Chicken Soup for the Soul at Work will nourish your spirit with stories of courageous leaders and will foster your creativity with examples of inspiring breakthroughs. It will also teach you how to enrich yourself and your coworkers through heartfelt acknowledgment. This powerful book gives you new options, new ways to succeed and, above all, a new love and appreciation for yourself, your job and those around you. Share it with your mentor, coworkers or staff, and enjoy renewed joy and pleasure in your chosen vocation. The reality is that writing is a lonely, private and poor-paying affair. For every writer kissed by fortune there are thousands more whose longing is never requited. Even those who succeed often know long periods of neglect and poverty. I did. When I left a 20-year career in the Coast Guard to become a freelance writer, I had no prospects at all. What I did have was a friend in New York City, George Sims, with whom I’d grown up in Henning, Tennessee. George found me my home, a cleaned-out storage room in the Greenwich Village apartment building where he worked as superintendent. It didn’t even matter that it was cold and had no bathroom. I immediately bought a used manual typewriter and felt like a genuine writer. After a year or so, however, I still hadn’t gotten a break and began to doubt myself. It was so hard to sell a story that I barely made enough to eat. But I knew I wanted to write. I had dreamed about it for years. I wasn’t going to be one of those people who die wondering, What if? I would keep putting my dream to the test—even though it meant living with uncertainty and fear of failure. This is the Shadowland of hope, and anyone with a dream must learn to live there. Then one day I got a call that changed my life. It wasn’t an agent or editor offering a big contract. It was the opposite—a kind of siren call tempting me to give up my dream. On the phone was an old acquaintance from the Coast Guard, now stationed in San Francisco. He had once lent me a few bucks and liked to egg me about it. “When am I going to get that $15, Alex?” he teased. Six thousand a year! That was real money in 1960. I could get a nice apartment, a used car, pay off debts and maybe save a little something. What’s more, I could write on the side. Afterward, as I paced around my little room, I started to feel like a fool. Reaching into my cupboard—an orange crate nailed to the wall—I pulled out all that was there: two cans of sardines. Plunging my hands in my pockets, I came up with 18 cents. I took the cans and coins and jammed them into a crumpled paper bag. There, Alex, I said to myself. There’s everything you’ve made of yourself so far. I’m not sure I ever felt so low. I wish I could say things started getting better right away. But they didn’t. Thank goodness I had George to help me over the rough spots. Through him I met other struggling artists like Joe Delaney, a veteran painter from Knoxville, Tennessee. Often Joe lacked food money, so he’d visit a neighborhood butcher who would give him big bones with morsels of meat and a grocer who would hand him some wilted vegetables. That’s all Joe needed to make down-home soup. Another Village neighbor was a handsome young singer who ran a struggling restaurant. Rumor had it that if a customer ordered steak, the singer would dash to a supermarket across the street to buy one. His name was Harry Belafonte. People like Delaney and Belafonte became role models for me. I learned that you had to make sacrifices and live creatively to keep working at your dream. That’s what living in the Shadowland is all about. As I absorbed the lesson, I gradually began to sell my articles. I was writing about what many people were talking about then: civil rights, black Americans and Africa. Soon, like birds flying south, my thoughts were drawn back to my childhood. In the silence of my room, I heard the voices of Grandma, Cousin Georgia, Aunt Plus, Aunt Liz and Aunt Till as they told stories about our family and slavery. These were stories that black Americans had tended to avoid before, and so I mostly kept them to myself. But one day at lunch with editors of Reader’s Digest I told these stories of my grandmother and aunts and cousins; and I said that I had a dream to trace my family’s history to the first African brought to these shores in chains. I left that lunch with a contract that would help support my research and writing for nine years. It was a long, slow climb out of the shadows. Yet in 1976, 17 years after I left the Coast Guard, Roots was published. Instantly I had the kind of fame and success that few writers ever experience. The shadows had turned into dazzling limelight. For the first time I had money and open doors everywhere. The phone rang all the time with new friends and new deals. I packed up and moved to Los Angeles, where I could help in the making of the Roots TV mini-series. It was a confusing, exhilarating time, and in a sense I was blinded by the light of my success. Then one day, while unpacking, I came across a box filled with things I had owned years before in the Village. Inside was a brown paper bag. I opened it, and there were two corroded sardine cans, a nickel, a dime and three pennies. Suddenly the past came flooding in like a riptide. I could picture myself once again huddled over the typewriter in that cold, bleak, one-room apartment. And I said to myself, The things in this bag are part of my roots, too. I can’t ever forget that. I sent them out to be framed in Lucite. I keep that clear plastic case where I can see it every day. I can see it now above my office desk in Knoxville, along with the Pulitzer Prize; a portrait of nine Emmys awarded to the TV production of Roots; and the Spingarn medal—the NAACP’s highest honor. I’d be hard pressed to say which means the most to me. But only one reminds me of the courage and persistence it takes to stay the course in the Shadowland. It’s a lesson anyone with a dream should learn. ~ Alex Haley.